But he who sins against me injures himself; all those who hate me love death. One of the themes on this blog is that the only real division between humans on the earth is the division between those who love God and those who hate God. While there are those who think they can sit on the fence, ultimately, when they die and face their Creator, they will be either saved or lost. 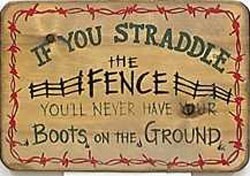 There are lots of those who think they can be fence sitters, as we saw in the last posting. But they only think they are able to straddle both sides. In the end, God will say whether they were for Him or against Him. My prayer is that Christian women will make it plain which side of the fence they are on, not only for themselves and their relationship to God, but for the sake of others. We need to stand firm, in spite of the personal cost, so that others will be more courageous and take a stand also. If more of us are pulling together, the lives of many more helpless babies could be saved. Jesus told us that we are not to judge in the sense that we play as God and condemn others. However, He did tell us that we can know who the bad people are by their fruits. He said, “You will know them by their fruits. . . every good tree bears good fruit, but the bad tree bears bad fruit” (Matthew 7:16,17). I have said in a previous blog, that there is a dividing line between those who love God, love life, peace, and unselfishly love others, and those who hate God, hate life, hate peace, and are extremely selfish. Nowhere is this illustrated more clearly than in the struggle between pro-life folks and abortion proponents. In that blog, I contrasted the lives of some godly women with some selfish women. (see “Women for Truth and Life”, posted on September 28, 2011). There, I showed how plain the dividing line is between those who love and those who hate. 1. October 26, 2011 (LifeSiteNews.com) – Two former employees of late-term abortionist Kermit Gosnell have pled guilty to 3rd degree murder charges for their roles in the deaths of an abortion patient and one baby born alive during a failed late-term abortion. According to testimony by former employees, Gosnell and his assistants killed “hundreds” of newborn babies by severing their spinal cords rather than killing them in the womb. Upon entering the building, investigators were hit by the stench of cat urine and the sight of drugged and moaning women lying on blood-stained blankets. Flea-ridden cats defecated freely on the bloodied floors. “As disturbing as this case is, we know that what went on at Gosnell’s abortion mill is little different than what goes on at late-term abortion mills around the country,” said Operation Rescue President Troy Newman in response to the news. 2. October 26, 2011 (LifeSiteNews.com) – A video released recently by Pro-Life Wisconsin, shows abortion clinic workers laughing as an ambulance pulls up outside the facility to fetch a woman injured from a botched abortion. According to the pro-life organization, this is “at least” the third time this year that an ambulance has shown up at the abortion facility after a botched abortion. Note: The workers were laughing. Does this not prove that those who hate God love violence and death? Also, please note that this was a “legal” back alley abortion. Does this not show a fallacy in the pro-abortion argument that somehow making the killing of babies legal would keep “abortion safe”? And anyway, we have to ask the question, “Safe for who?” Certainly not the innocent unborn child. And here is the contrast that I think should be noted – “Over a thousand pro-life supporters calmly and with dignity braved the taunts and insults of vocal and disrespectful protesters to listen to calls to protect life, and to pray for our opponents in this worldwide battle to stop abortion,” said March for Life attendee Mary Longlois, an American, who advocates for pro-life issues on behalf of HLI at the United Nations. Pro-life women – calm, dignified, brave, prayerful, peaceful. Pro-death women (called “anti-life” by these honest reporters) – insulting, disrespectful, violent, and not unwilling to break the law. These incidents are only a sampling of what has been happening. I believe that this is because the pro-life folks are gaining the high moral ground politically and socially. Pro-death people are afraid. 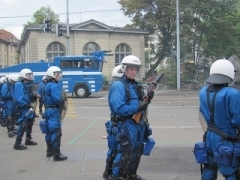 They are responding with violence. Why should we be surprised? Anyone who doesn’t think anything of killing a helpless, unborn baby wouldn’t think anything of breaking the law and physically harming an adult. In conclusion, here is an interesting testimony from the wife of an abortionist. This incident occurred recently, during the PEACEFUL 40 Days for Life vigils that were happening all around the country. 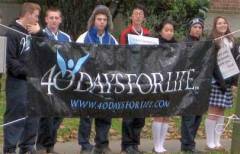 “There is much to meditate upon from this conversation,” said the 40 Days for Life volunteer. “It confirmed the constant presence, the peaceful method, the prayerful attitude. It helped give me a renewed sense of dedication to continually trying to get people to sign up so that we can have a constant presence on the sidewalk. We never know who will see us and when they will see us.” Note two things again – peaceful and prayerful. This story just illustrates again what the followers of the Lord Jesus are about. As followers of Christ we are willing to sacrifice our time for the sake of others. We are willing to face the taunts of those who hate us because they hated God first.